Glen Morgan’s dark and violent conspiracy thriller sets itself up as inheritor to the X-Files; but if that doesn’t put you off, then shades of The Da Vinci Code and Labyrinth just might. Wearing its heart on it’s sleeve, Intruders blows its well-executed mystery set-up in the first episode to reveal its dark underbelly to the audience; reincarnation. Played like Invasion of the Body Snatchers. That’s it. So all that John Sim, Mira Sorvino and the rest of the cast can do is plod through some familiar territory – Vancouver; standing in for Seattle and Portland, again. Britain’s John Sim (TV’s State of Play) is pitch perfect as ex-LA cop turned author Jack Whelan (why are all US leading men called Jack?) Mira Sorvino (Mimic) is his wife Amy, who has a birthday and in the biggest mid-life crisis, turns jazz-fan and disappears in Seattle. Cue Jack going to search for his missing wife with only her iPhone messages and pics for clues. That, and a taxi driver who overhears her claim to be in the Russian Tsar’s secret police. There’s an oily lawyer in a smart office and a condo, with two ineffectual heavies failing to put the frighteners on ex-cop Jack. Meanwhile, the black-coated and shifty one-man execution squad Richard Shepherd (James Frain) is killing conspiracy theorists (and anyone who knows them) who have linked dodgy infra-sound frequencies to the secret society Qui Reverte. Shepherd takes pity on nine-year old Madison (brilliantly played by Millie Brown) who is apparently the reincarnation of series psycho Marcus Fox; catchphrase “what comes around goes around.” Or is it “what goes around comes around?” Anyways it’s utterly meaningless, but somebody thought it was a catchy line for reincarnation thriller, although I got sick of the repetition by episode two. Oh, I really don’t give a rat’s rear-end what happens next. It’s the Emperor’s new clothes. It’s Dan Brown with a diploma, Close Encounters with dead folks instead of aliens, X-files with no monsters, Fringe with no… Fringe. It’s a show shot with bravura and top production values where everything is pitched in the first two episodes; begging, nay pleading not to get cancelled like The 4400. A-lister Sorvino is rationed to a couple of scenes and some flashbacks, while watchable John Sim tries to build a performance out of a character that doesn’t work, joining pals Andrew Lincoln, Tim Roth, David Morrisey et al. on the Brits-abroad ‘let’s get famous in America’ wagon train. Shepherd manages to look sinister, queasy, or goofy depending on the lighting and splatters the ketchup around indiscriminately blowing holes in people with his trademark (gimmicky) double-barrelled ’45. We’re meant to care about Jack and his dark past as a cop and whether he can find Amy; I didn’t. We’re supposed to care whether Marcus Fox can be exorcised and Madison saved; which I don’t. 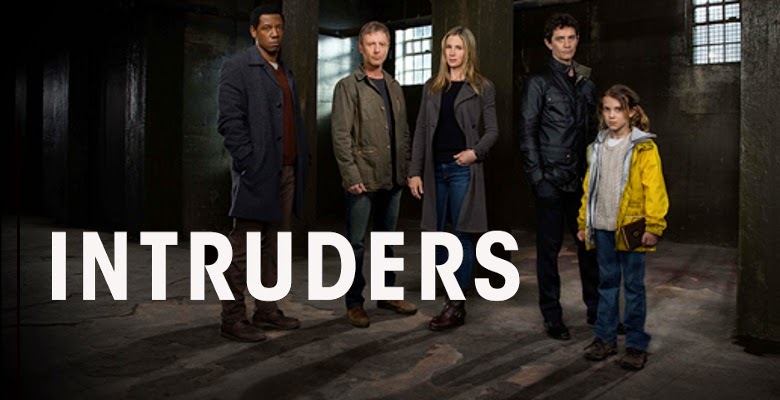 Intuders is a mini-series idea spun out to series length; technically impressive, for me it ran out of road inside two episodes. You know with this kind of US drama series where so much is shot at night, or in the rain, or both, that the conspiracies will pile up, the plot twists will get more ludicrous, and any character could suddenly turn into someone else. Dollhouse took this idea so far over the top and out of sight, nobody can play the idea sensibly ever again. Person of Interest is equally loopy but at least has some people of interest.